rec. April 2010, Nicholas Music Center, Rutgers University, New Brunswick, NJ. Packaged in a slimline card digipack but with fulsome booklet notes, this attractive release arrived as a bit of a surprise extra but certainly a most welcome one. Musica Raritana is part of the Rutgers University education programme, providing students “performance opportunities in baroque and classical performance practice, coached by major players in the field.” This kind of practical combination of teaching and performance works very well and is done increasingly widely these days as I know from my experience working at the Royal Conservatoire in The Hague. The results here are certainly of a refreshingly high quality. Christoph Hammer plays a replica of an 1815 Streicher grand piano built by Thomas and Barbara Wolf. This has a light but attractive music–box sound which goes well with the small string groups for each work. The Piano Concerto uses six violins, two violas and cellos plus a violone, or five-string Viennese bass. The playing is in historically informed style, which means no vibrato, adding to the antique feel of the whole. Andrew Kirkman’s notes on performance style discuss the Paris school of violin playing which was different to the approach of influential artists of the time such as Paganini. Vibrato is thought to have been “one of a battery of techniques of ornamentation, rather than, as today, that of a more or less persistent colouring of the tone.” While this is adopted here there is no lack of interest in the string playing, and I would point out the little portamento at 0:41 in the Adagio of the concerto as a nice added touch. 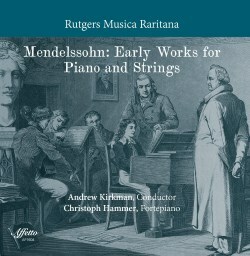 Arguments on the subject of vibrato still go on, but either way the claim is made for this recording that it this fills a gap in presenting these works “in a manner attentive to the performance practice of their own time.” Mendelssohn was only twelve years old in 1821, but his Piano Concerto in A minor is a remarkably assured work. He composed it for his sister Fanny, modelling it on a concerto by Hummel also in A minor, and also absorbing the influences of Mozart and C.P.E. Bach. There is beauty and drama in equal measure, from the atmosphere of the lovely Adagio to the turbulence of the final Allegro ma non troppo, and the piano part is by no means an easy ride, with no shortage of virtuoso passagework. The Sextet from a few years later is another remarkable product of Mendelssohn’s Wanderjahre, with plenty of original touches to go along with the young composer’s involvement with the works of Beethoven. The single vibrato-free strings inevitably sound more fragile here, and there are some less comfortable moments as a result. The piano part has the dominant role however, and this can still count as an enjoyable recording. As regards comparisons this is a tricky one as the alternatives are all on modern instruments. If you want a warmer recording of the Sextet then The Chamber Music Society of Lincoln Center Players on the Delos label (review) is a pretty safe bet, as is I solistici Filarmonici Italiani in CPO (review) which lays claim to a certain amount of ‘period performance’ in terms of approach but still uses a modern piano and goes by no means as far in this regard as Rutgers Musica Raritana. For an impression of how Mendelssohn might have heard his music in 1822 and 1824 this is a valuable recording, most especially for the Piano Concerto in A minor.